Mirrorstone’s 5ft T8 LED Tube Light is a great, energy efficient replacement for your existing fluorescent tube. It uses just 20W to power an incredible 1800 lumens of light – rivalling some floodlights in terms of output. A non-LED tube light would use 6 times more energy to shine with the same brightness – a substantial 120W! 50,000 hours of life ensures that you won’t need to change your T8 tube light for at least 15 years with an average daily use of 8 hours. It’s good quality light too, with a colour rendering index (CRI) of 70. This means objects in your choice of room appear close to how they would under natural light. The light itself is distributed across an 180o beam angle, making it ideal for wide open areas like garages or supermarket shop floors. The size makes it ideal for commercial applications, as it is one of our longer tube lights, coming in at 1500mm (5 ft). Smaller areas would benefit from something like our 900mm 3ft T8 LED Tube Light. It’s shorter at just 3 ft, and uses less energy at 15W. As you would expect it isn’t as bright at 1100 lumens, though it is still 6 times more efficient than an equivalent fluorescent tube light. 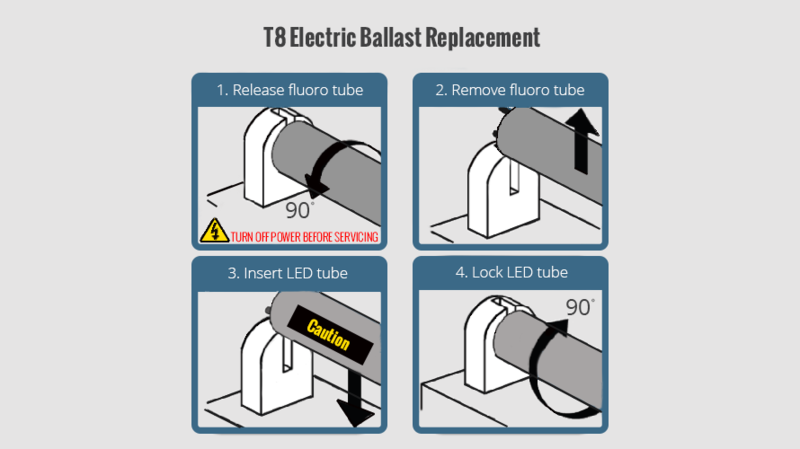 Please have a browse of all our T8 Tube Lights to ensure you’re getting exactly what you need. 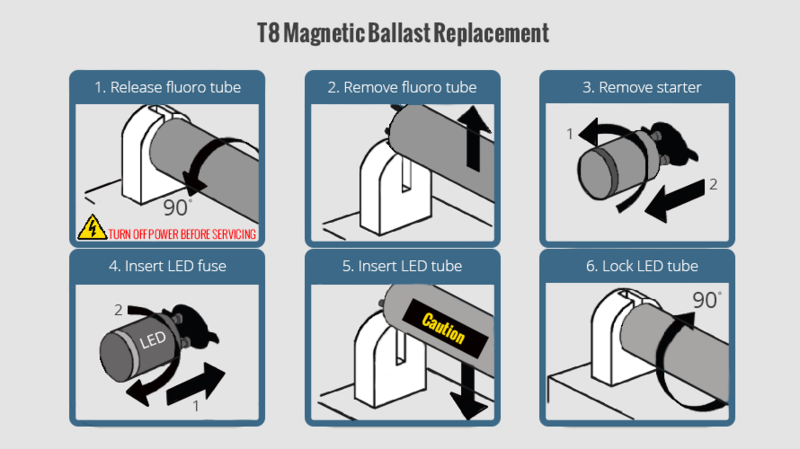 You should be aware that T8 LED tubes will not work with the ballasts on your existing fittings and some simple rewiring will be required. If you are unsure about anything or do not feel confident attempting this work yourself, we highly advise speaking to a qualified electrician. You’ll get to pick what kind of light you would like when you buy your T8 tube light – with warm white (3000K) and cool white (6000K) making up the options. Colour temperature is simply a measurement of the perceived warmth of a light, using Kelvins as the unit of measurement. Warm white helps create a cosy atmosphere, and it replicates the shade emitted by conventional halogen bulbs. This makes it perfect for places that need to feel comfortable like the living area or the bedroom. Cool white on the other hand is more penetrative thanks to it being brighter and harsher. This is better suited to areas where you need to concentrate – the kitchen or office for example. Some products also come with a third option – day light (4000K). This brings the best of both – the warmth of warm white and the brightness of cool white, though this option isn’t available on our featured T8 tube light. Why Should You Use LEDs? There are loads of reasons why you should switch over to LEDs. For a start, our 5ft T8 tube light doesn’t make any buzzing noises, doesn’t flicker and comes on instantly – a stark difference to traditional fluorescent tube lights. Then when you do switch them on, they save you money! This is because they are so energy efficient. LEDs are up to ten times more efficient than halogen lights. They achieve this as they only lose around 10% of their energy to heat wastage. Halogens on the other hand lose up to 80% to heat wastage, and use far more electricity as a result. Your bills come for less when you use LEDs, and your lights suffer less wear and tear too. This incidentally gives LEDs their phenomenal lifepsans, saving you the need to buy replacements all the time. This equals yet more savings! You should take advantage of our discount codes page, where we run a series of offers that could net you up to 20% off selected items – including this 5ft T8 tube light. Did we mention that you could save even more money through volume discounts? Buy 5 or more units and you’ll get a special bulk buy price. We have a 28 day home trial period in place, during which you’re eligible for a full refund or exchange if you no longer want your tube light. Whether there is any kind of problem, or if you’ve simply changed your mind, the product just needs to be in a re-sellable condition with all its original contents. Beyond this, you have Mirrorstone’s 2 year warranty to fall back on if you run into any other problems further down the line. Please feel free to get in touch with us if you have any other questions about this 5ft T8 tube light, installations, wholesale purchases or anything else. Send us an email at cs@wled.co.uk, or give us a call on 0116 321 4120. Excellent, just about to order some more. instant on, no flickering with lathe, good lighting, well worth the cost. Just change the starter, plug it in and away it goes, perfect. Nice white instant light and speedily delivered too. We ordered the "cool white" and the box was marked as such but contained "warm white". These were ok but we preferred to have what we ordered. took the old one out, put the new one in. Works perfectly very happy with the product. Great tube light as bright as my old one but only 20w rather than120w! Fantastic Product very easy to install, great product great service.